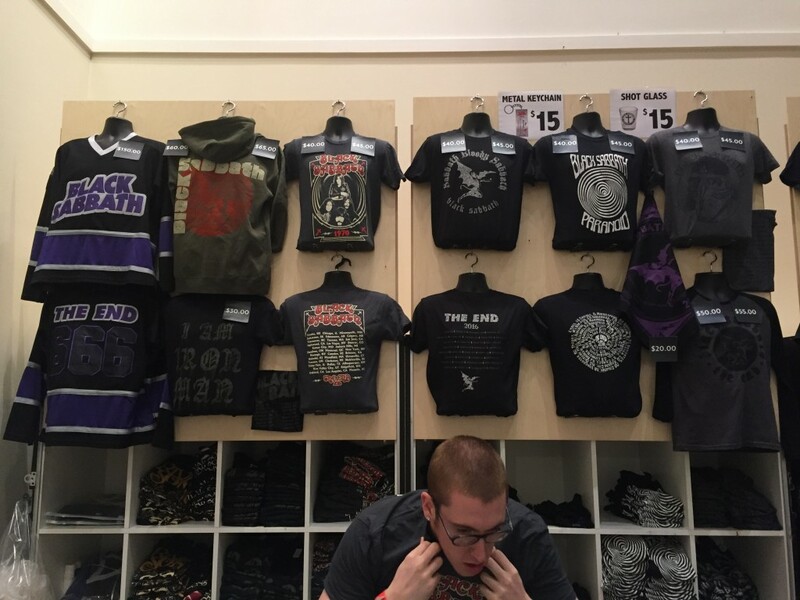 Thought folks might want to see this, so I enlisted a friend at the Las Vegas gig to take some pictures of the Merch tables. Check out the pics below to see what they’re selling. $100 for an autographed “The End” CD is kind of pricey, IMO. If you click on any of these, it will spawn a larger version. However, if you right click and “open link in another tab” (or window), you’ll get a MUCH larger version, and you can really zoom in on the stuff. Just curious, did any viewers, attend the Winnipeg show? What was the price of the standard black t-shirt? I am from Thunder Bay, Ontario, Canada, and I attended the Minneapolis show. I got the black t-shirt $45.00US Visa. Later, I got my Visa statement and it was ~$70Cdn! btw, I got two “Mob Rules” t-shirts, that I purchased in 1982 for < $8.00Cdn each, concert ticket was $9.50Cdn! Yikes! Expensive! I just dropped close to 700 dollars on tix. $45 bucks for a t-shirt. Come on guys. How about cutting prices in half! We are the fans, we love you but the prices are steep! Agreed David ! Prices like a KISS concert ! First, I’d like to wish Anthony Frank “Tony” Iommi a happy 68th birthday today; I believe they’re playing in Detroit tonight. 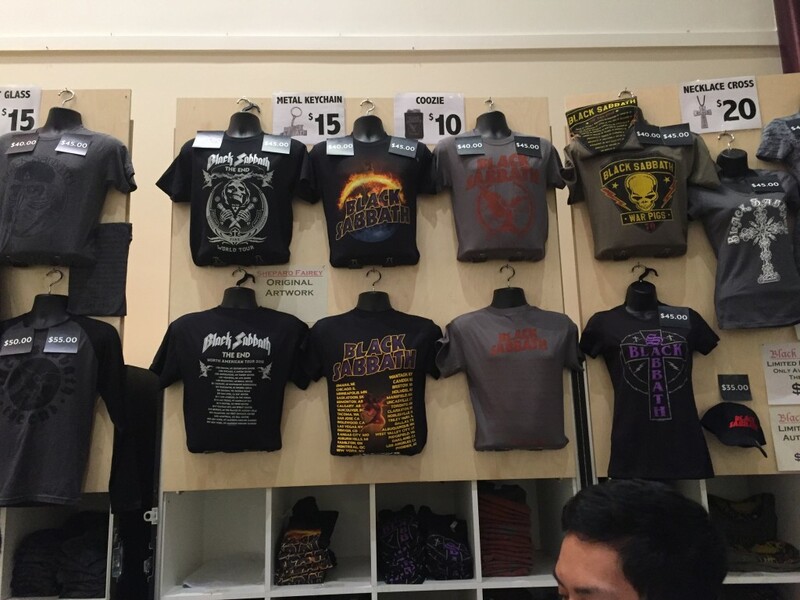 Anyway, thank you Joe for putting up these pics of the merch stands. It really shows the diverse products available for this tour and the outrageous gouging going on for some of these items on ebay right now. For instance, I’ve seen these lithographs (posters), a different one for each show, go anywhere from $75 to $700 online! The $30 cd is already coming way down; I saw a sealed one last night sell for $38.02 plus $6.00 shipping. Another great item, not shown here, is the VIP only book (~$149 – $300) on ebay. People need to be patient; there will be plenty of these items and at much lower prices with many more shows to come! 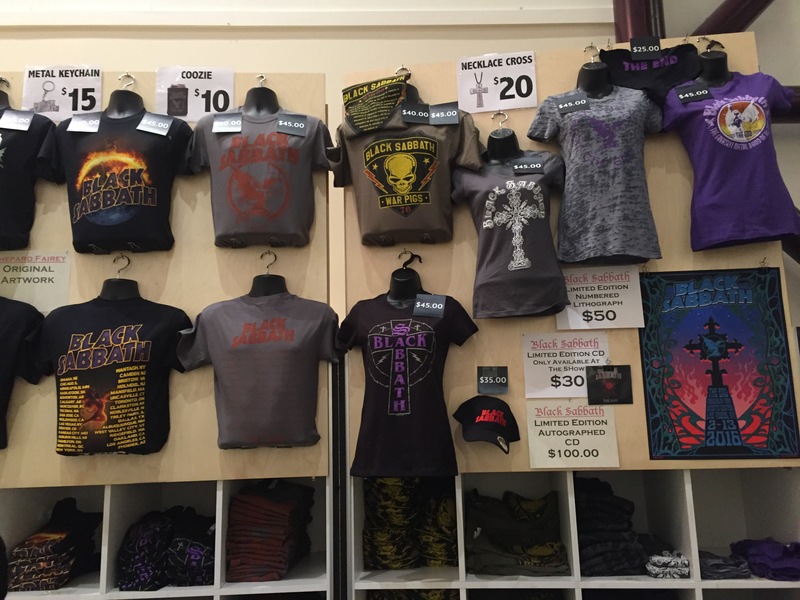 I’d rather be the fan who does not have these items YET than the fool who plunked down a fortune for a cd ($150), a shirt ($100), a poster ($250) & a VIP book ($225). I have two VIP books. You get one with Meet and Greet and sound check. Which is what I did for two of the three UK shows. No there will not be anymore books. Except for any extra made for the End shows. Which I’m sure Tony will put up for Auction or sale. Proceeds to Cancer research and wythall Animal Sanctuary. People are selling theirs as the gentleman said. I’ve only seen them for 299 -350. I’m struggling trying to decide if I want to sell one. I hate parting with anything Sabbath, but I do have Two and crossing the pond, wasn’t cheap. Well worth the debt. I have a question. I’m not to smart when it comes to Lithographs. I was at the Vegas show and when I asked if they had any he showed me what looked like a poster. Smaller then the average poster and made with thick paper/Card board. I don’t think it is a litho, but I liked it, so I bought it. I would just like Ronnie for sure. I googled “what’s the difference between a poster and a lithograph”. I’m sad to admit. I didn’t understand explanation whatsoever.lol Help. Do the merch tables take credit cards? Don’t really want to walk around Manhattan with a lot of cash on me. 1970 shirt- is that Bill Ward? Did he agree to his image being used? Not pictured here is the “boy shorts” for the ladies. Bought a pair for my wife and I must say she looks mighty fine in them!! Did the VIP thing in Detroit and it was an awesome experience!! I went to the Hamilton show in Canada and found prices were pretty crazy. It’d odd how the prices of somethings changed but others did not. The signed CD was still $100 (so maybe $60us). The cross necklace was still $20 canadian and the regular cd was $30. Tshirt prices were 45 canadian for most. However it looks like the merch guys were counting on us all being Hockey fans and raised the price of the hockey jerey to $250!!!! I didn’t see a single person buy one. Funny how prices increased from the 13 tour where the hockey jersey was $120 and autographed cd was $50. I paid $45 for a t shirt the last time around. Could have bought one from the counterfeiters roaming the parking lot for $10 but chose not to. Would I pay a $100 for an autographed CD? Maybe! Since i don’t have any and it may rise in value years down the road. Everything is expensive today just not concerts. Cost an arm and a leg to go to a ball game. That’s life! Was waiting two times to get the cd but nothing they wont 100 AU dollars for autographed one……..
What a scam,autographed by Sharon? Ozzy cant sing or walk all Perth was laughing at him what a waste of money for the tickets……..
Is there any way to buy these now? after the show is over? Nope. I don’t think you’ll see them for sale anywhere else until the entire tour is over. Can’t wait for the Stockholm Sweden gig … all time favs I grew up on. 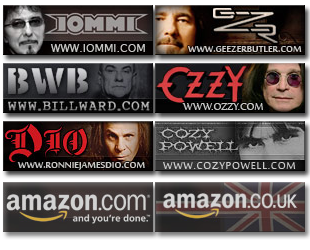 Old now Ozzy not singing in tune anymore, despite that their still my heroes. Shame Bill is not there, maybe not fit to do it. Same price was for signed 13 album, and it was standard 2CD 11 track edition. I guess they are too old to come after the show to sign CDs from people, or their management does not allow them too. I remember similar situation after Deep Purple concert, we had to wait few hours before the band got out the back door from the venue and the manager shouted to line up she rolled red-white tape and told people not to cross it and told the band to sign one item only and move further to the next person. But I was sneaky enough for Ian Paice to sign me two CDs. We have exclusive deals with tshirt brands. Do you now were i can buy the green war pils t shirt? will the tour shirts be available after the tour has concluded? I got two but the one I really wanted was sold out in my size. I was hoping to get the war pigs shirt. Pretty poor designs and very over priced! Coolest shirt imo was the purple one, for chicks. Bummer. I was at the show in Budapest last night, but there wasn’t size M of this 1970 t-shirt, can anyone please tell me where I can buy it? I wanted a 1970s tshirts too..if you find out how to get one, will you let me know? Were can i buy the green war pils t shirt? How much is the ballcap? 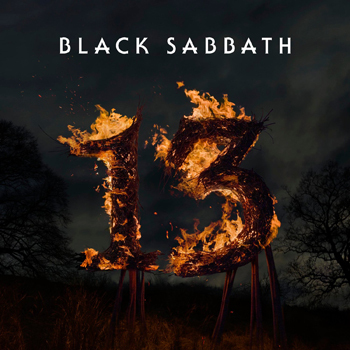 Where can I get the Sabbath hoodie sweatshirt (to the right of the hockey jersey)?! It’s not on their online merch store! vip personally signed by ozzy the end tour book from his dressing room worth? Looking for that grey sweatshirt in a 2xl if anyone bought an extra :-). So I need THe end t shirt but one that states San Antonio TX on it size XL IF anyone is selling or know where I could get one. Contact me please. London had very limited merch, we got no posters at all, Birmingham did. So annoyed, I like my posters! Hi. What was the name of the company handling the merchandise stand at the gig please? The grey women’s shirt slim fit with the cross.. need one . If someone has a small please contact me. Need it very badly.